Can Adults Learn to Play the Violin? We often get asked by adults if we think that they could learn to play the violin. They have heard it's very difficult but they've loved the sound for years and would really like to play. We always explain that if they are prepared to take the time to practice and not get easily discouraged then there is a good chance they will be playing quite well after a few years. I think it's fair to say that they will never get to professional concert standard, even if you start at 6 or 7 years old only a few have the talent and dedication to get to that standard. 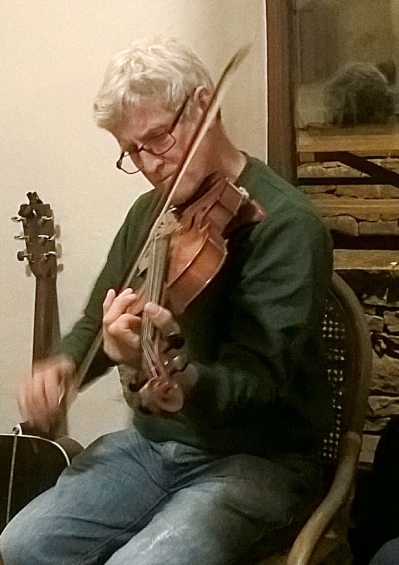 There are several important requirements for adults, the first is a half decent, properly set up violin, ideally from The Violin Company, we specialise in violins and we're staffed by people who play the violin. Secondly you need a regular time to practice. This doesn't have to be all in one block and it's probably better if it's split over the day. To begin with, two half hour periods are much better than one complete hour. Very few people can concentrate really hard for an hour and you really do have to concentrate especially when you start. Most people have little oportunities throughout the day, 10 minutes here, 10 minutes there, it all adds up and with short practice sessions you don't get so tired. The next important thing is to be realistic about your progress and not get discouraged. The problem with adults is that they know what a violin should sound like, they've seen accomplished players at concerts, live or on television, and it looks so easy. It comes as a bit of a shock to many when they find they can't produce that lovely tone or play so accurately. Adults also have a time scale and it's usually too short. Unless you are a very gifted individual you will not be playing like Paganini after a couple of years. Children don't seem to have this problem, if it takes a year to play a D major scale, well that's how long it takes. They tend to learn the violin as one more thing in their busy lives, along with Maths, English, Geography etc. Very few seem to have any pre-conceived ideas as to how long it might take or how good they might eventually become. I hope this hasn't discouraged you too much. Playing any musical instrument is hard, the violin is maybe a bit harder. However there is nothing to compare that feeling when you finally play a piece and somebody says, "honestly, that sounds really good". The first two or three years are the worst but once you are able to play with other people you'll be amazed how much fun it can be. Still with me then - good. You'll need a violin with a bow and some rosin and a case. That's pretty much what a violin outfit consists of. Now you need to decide what sort of violin you are going to buy. I bet you've got some idea of how much you want to spend already. I would heartily recommend that wherever you buy the violin you make sure that it is fitted with good quality strings. They make playing so much easier and more pleasurable. You should be looking at synthetic cored strings like Corelli Crystals or Thomastik Dominants. They are softer under the fingers, not like the cheesewire steel strings fitted to budget violins, and they produce a much nicer sound, warmer in the bottom registers and not screechy on the top strings. You're an adult, you know what a violin should sound like and these strings will get you closer to that sound from the word go. You also need to make sure that the violin is set up correctly, read our Set Up page to get an idea what to look for. There are other things you should consider buying. Firstly a Shoulder Rest. This clips under the violin and rests on your collar bone. It really helps to support the instrument and stops it wobbling about. It also helps to prevent damage to the muscles in your neck, which can happen when you have to bend your neck to get your chin in the chinrest on the top of the violin. If this is your first instrument then you would be well advised to buy a tuner of some sort. The modern electronic tuners are very inexpensive and will not only show you when the individual strings of the violin are in tune but will also show you how accurately you are playing any other note. A music stand is also a good idea, the folding lightweight ones are not too expensive and you will be able to use it for years to come. A good teacher will really make a difference to your progress. This is especially important when you first start. Holding the violin and particularly the bow is not intuitive for most people and if you get it right from the beginnning you will progess so much more quickly. A teacher will show you this. They willl also keep you inspired and feed you suitable pieces to play. Some teachers have applied to be on our Links page, you might find someone there. There is a considerable quantity of teaching material available on the internet now. You Tube is particularly prolific. Our favourite is Professor V you'll find his first lesson here.